KFC does some of its finest work overseas, and its latest foreign innovation is yet another spin on the timeless Double Down. Hitting select stores in the Philippines this week is the Double Down Dog, a cheese-laden frank nestled inside an all-fried chicken bun. KFC Philippines launched the limited-run menu item today, offering just 50 dogs at each of the 11 branches. They obviously sold out already, but will be selling another small batch tomorrow at the same locations. 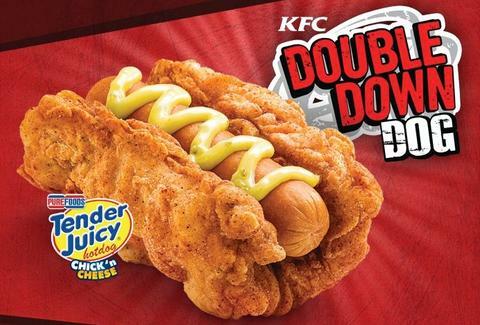 While some of the photos of the Double Down Dog in the wild look questionable, it's been pretty well-received thus far, and could get an extended stay if the same rabid hordes show up again tomorrow -- which seems likely, given the public's boundless appetite for double-meat treats. Kristin Hunt is a Food/Drink staff writer for Thrillist, and is trying to scrub the Twitter photos of this thing from her brain. Follow her at @kristin_hunt.